HHC is a movement to help fight obesity by certifying and empowering instructors to teach children and families about nutrition and healthy cooking. Their instructors are passionate moms, dads, teachers, nutrition grads, entrepreneurs, wellness advocates and more. The food is tasty and children love to help create these delicious, good-for-you dishes. Choose one of these recipes to add a new twist to your family favorites, or make them all and serve to family and friends as one delicious meal. We promise, everyone will love the food – with or without knowing that the dishes are good for you and yours. Garnish with cubed watermelon, chia seeds and/or fresh or dried mint leaves. Wash and dry orange. Grate a bit of orange peel and set aside. Peel orange and slice into 5 or 6 rounds. Place sliced oranges neatly on a plate. Wash and slice strawberries and place on top of oranges. Wash and dry blueberries and arrange on top. Place washed, torn mint leaves on top. Mix yogurt and orange rind (zest) as a dressing and drizzle or dollop on top of salad, or serve as a dipping sauce on the side. Recipe can be doubled, tripled, etc. as required and served as individual salads or arranged on a large serving platter. 1 8oz. box of pasta (approx. 2 cups cooked) such as whole wheat, gluten-free, spinach, black bean, quinoa pasta, etc. 2 cups chopped fresh veggies such as peppers, cucumbers, tomatoes, broccoli, carrots, etc. Cook noodles as directed. Once cooked, add 3 tablespoons olive oil, 1/2 teaspoon each salt and pepper, 2 teaspoons garlic powder. Mix, then stir in chopped veggies of choice. Multi colored veggies are terrific! If not making vegetarian dish, you can add chopped chicken or turkey, slices of pepperoni, or small pre-cooked shrimp. Serve warm or chill in refrigerator for 30 minutes before serving. Can be topped with 1/2 cup shredded cheese or Parmesan cheese (optional). Heat grill to 400°F (medium heat). Moisten grill with butter, olive oil or cooking spray. Wash and dry peaches. Cut, split in half, and remove pit using metal spoon. Place peaches cut side down, close lid, and grill for 4 minutes. Meanwhile, mix marinade ingredients in a small bowl. Turn peaches and brush with marinade. Close lid and grill 3 more minutes. Transfer peaches to a serving plate. 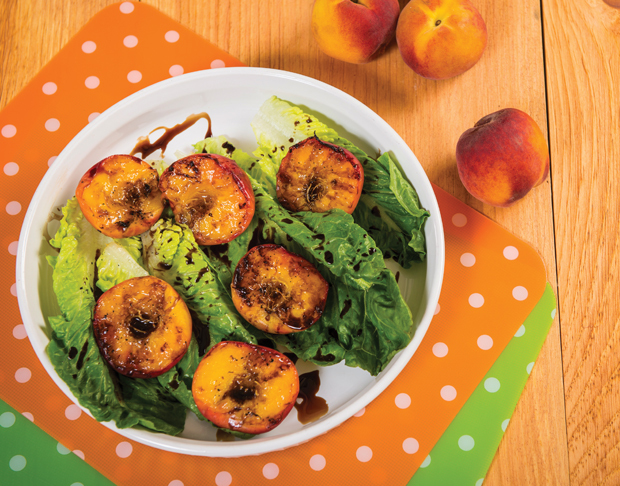 Brush or drizzle remaining marinade or a bit of balsamic vinegar over peaches. Can be served warm or cooled. Makes a great side dish for chicken, fish, and seafood or a yummy dessert served over vanilla ice cream with a drizzle of maple syrup. Soak wooden skewers in water for 5 minutes. Thread each chicken tenderloin onto individual skewer. Mix marinade ingredients (except for green onions) and pour over chicken. Let stand for 20-30 minutes. Heat indoor or outdoor grill to high. Place the chicken satay on the grill, 3 minutes per side (or until no longer pink). Meanwhile, heat remaining marinade in a small pot on the stove. Bring to a low boil for 3 to 5 minutes. Serve on the side as a dipping sauce or pour over chicken skewers just before serving. Garnish with fresh green onion slices before serving. Spray a 9 x 13 baking pan with nonstick spray. Measure dry ingredients into a large mixing bowl. Whip eggs and then stir in sugars, oil, vanilla and zucchini. Fold into dry ingredients until combined. Fold in chocolate chips. Bake for 45-55 minutes or until a toothpick comes back clean from center of cake. Let sit and cool completely. Dust with powdered sugar. For more information, to become an instructor, or find a cooking class near you visit HealthyHandsCooking.com.